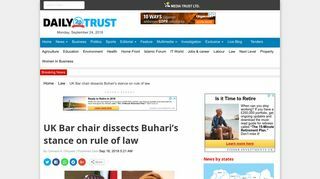 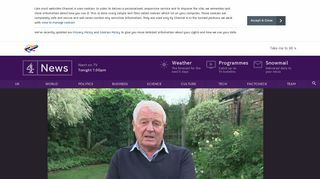 The Daily Trust (September 2018) "UK Bar chair dissects Buhari’s stance on rule of law"
Channel 4 (August 2018) "'Evidence lies there like a time bomb': Paddy Ashdown on how Assad may one day be brought to justice" BHRC Chair Kirsty Brimelow QC discusses the Syrian regime and universal jurisdiction for crimes against humanity. 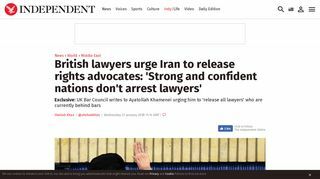 The Times (July 2018) "Trial observer Pete Weatherby, QC, banned from entering Kuwait"
Stockholm Center for Freedom (July 2018) "BHRC publishes interim observation report on trial of Zaman journalists in Turkey"
Politics Home (May 2018) "Bar Council: Pressure mounts on Prime Minister to raise barristers’ urgent concerns with Turkey"
Law Gazette (April 2018) "Alarm at mass jailing of Turkish lawyers"
Stockholm Center for Freedom (April 2018) "Int’l law associations: Turkey in breach of its international law obligations"
The Times (April 2018) "Colombian violence" by Edward Fennell. 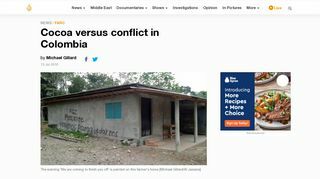 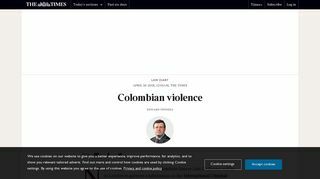 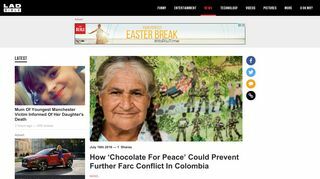 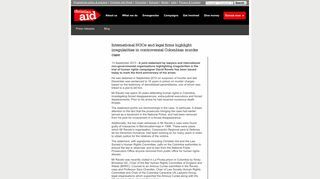 Interviews BHRC Chair Kirsty Brimelow QC regarding the persecution of human rights defenders in Colombia. 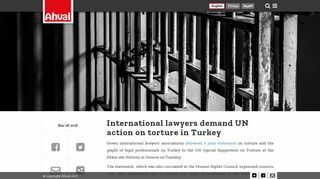 Scottish Legal News (April 2018) "Legal chiefs call on Turkey to release lawyers jailed in wake of failed coup" discusses BHRC letter calling on the Erdogan government to end its state of emergency. 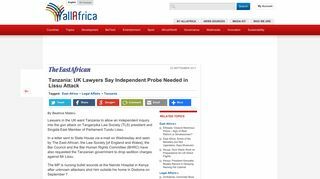 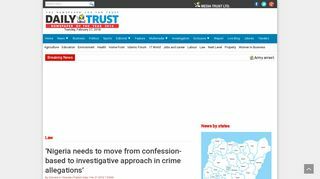 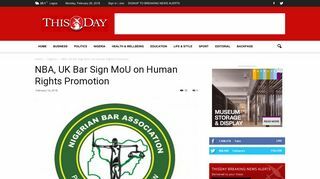 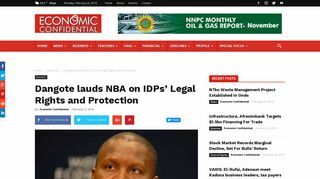 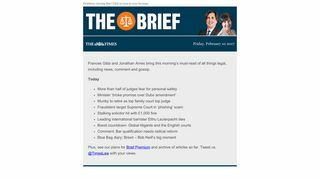 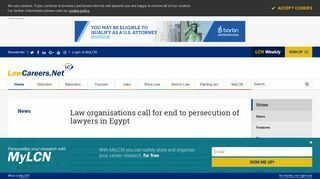 Ahval (March 2018) "International lawyers demand UN action on torture in Turkey"
Bar Talk (March 2018) "Ask Anything: Kirsty Brimelow QC"
The Daily Trust (February 2018) "Encounters: Taxi driver returned my lost bag on my first visit to Nigeria – Kirsty Brimelow"
The Nation (February 2018) "NBA signs pact with England Bar"
This Day (February 2018) "NBA, UK Bar Sign MoU on Human Rights Promotion"
Economic Confidential (February 2018) "Dangote lauds NBA on IDPs’ Legal Rights and Protection"
The Media Express (February 2018) "Civil Society Meeting Urges UN to Launch Inquiry into 1988 Iranian Massacre"
The Independent (January 2018) "British lawyers urge Iran to release rights advocates: 'Strong and confident nations don't arrest lawyers'"
LawCareers.net (January 2018) "Law organisations call for end to persecution of lawyers in Egypt"
The New Arab (January 2018) "Amidst rights abuses, 8th annual Day of the Endangered Lawyer focuses on Egypt" Discussing BHRC joint statement on Day of the Endangered Lawyer. 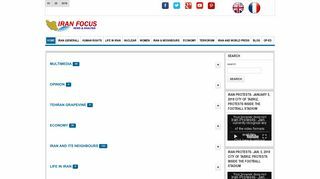 Relief Web (October 2017) "One step forward and two steps back for unaccompanied minors from Calais" Highlights on BHRC report on the dismantling of Calais refugee camp. 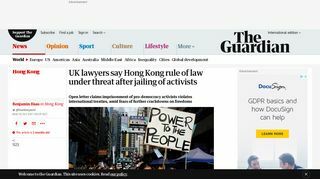 The Guardian (October 2017) " UK lawyers say Hong Kong rule of law under threat after jailing of activists" by Benjamin Haas. 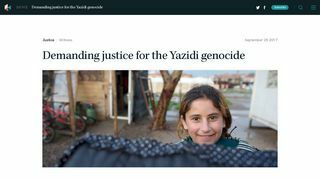 The Daily Sabah (October 2017) "400 migrant children in Calais separated from parents due to French delays, report says"
Reuters (October 2017) "Lawyers accuse UK-backed Bahrain watchdogs over torture inquiry"
Lacuna (September 2017) "Demanding justice for the Yazidi genocide" by Billy Briggs. 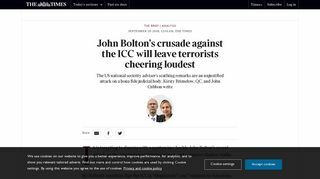 Recognising BHRC and Global Justice Initiative's submission to the ICC and BHRC Chair Kirsty Brimelow QC's op ed in the Times. 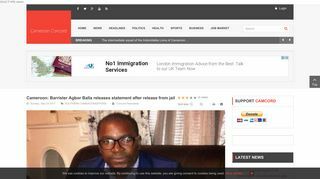 Cameroon Concord (September 2017) "Cameroon: Barrister Agbor Balla releases statement after release from jail" Agbor Balla thanks BHRC and other international organisations for their assistance in securing his release and that of other protestors. 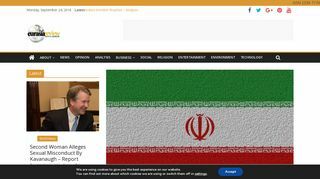 Iran Focus (September 2017) "Call for International and Independent Investigation Into 1988 Massacre" By Pooya Stone. 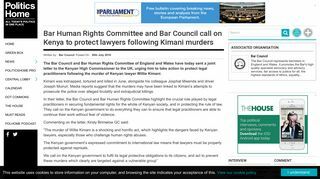 Discussion of event at Parliament where BHRC Chair Kirsty Brimelow provided legal analysis on the massacre. 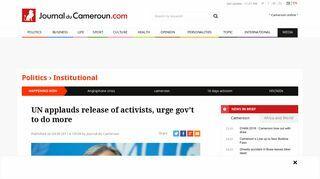 Journal du Cameroun (September 2017) "UN applauds release of activists, urge gov’t to do more" BHRC applauds release of Cameroonian protestors but continue to raise concern. 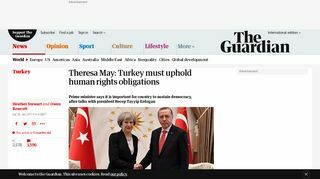 The Sun (September 2017) "READY TO TALK TURKEY: Theresa May to meet President Recep Erdogan to plot post-Brexit free trade deal" by Tom Newton Dunn. 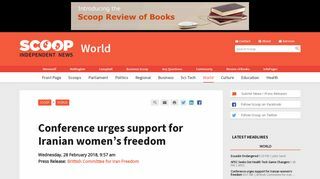 Includes a quote from BHRC Chair condemning Turkey's response to the attempted coup. 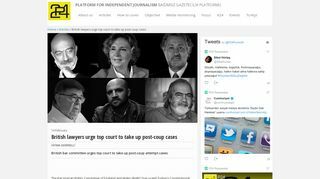 Stockholm Center for Freedom (February 2017) "BHRC Calls On Turkish Constitutional Court To Address Human Rights Abuses" Coverage of BHRC's letter to the Turkish Constitutional Court. 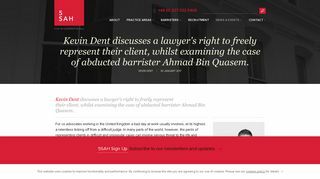 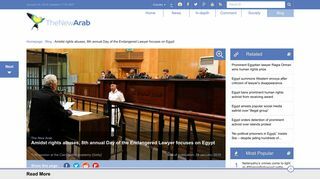 5 St Andrew's Hill (January 2017) "Kevin Dent discusses a lawyer's right to freely represent their client, whilst examining the case of abducted barrister Ahmad Bin Quasem." 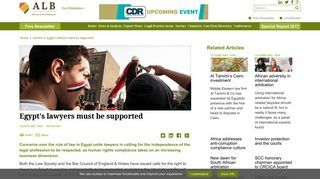 Highlights BHRC Chair's call for Bangladesh to release Ahmad Bin Quasem. 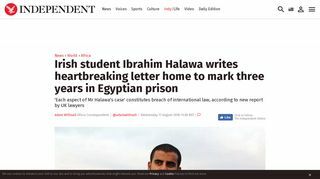 Independent (August 2016) "Irish student Ibrahim Halawa writes heartbreaking letter home to mark three years in Egyptian prison" by Adam Withnall. 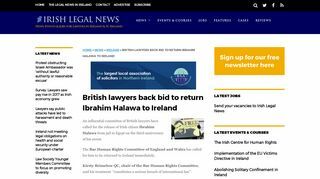 Highlights BHRC's call for the immediate release of Ibrahim Halawa. 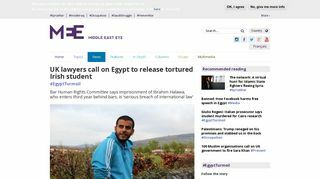 Middle East Eye (August 2016) "UK lawyers call on Egypt to release tortured Irish student"
Irish Legal News (August 2016) "British lawyers back bid to return Ibrahim Halawa to Ireland"
Politics Home (July 2016) "Bar Human Rights Committee and Bar Council call on Kenya to protect lawyers following Kimani murders"
LAD Bible (July 2016) "How ‘Chocolate For Peace’ Could Prevent Further Farc Conflict In Colombia" by Michael Gillard. 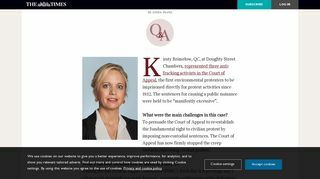 Discussing BHRC Chair Kirsty Brimelow QC's work in the Peace Community in Colombia. 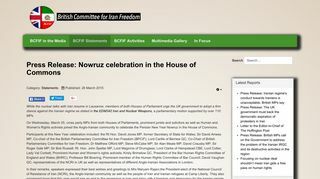 British Parliamentary Committee for Iran Freedom (March 2015) "Press Release: Nowruz celebration in the House of Commons" Highlights BHRC's criticism of the situation of Iranian prisoners at Camp Liberty in Iraq. 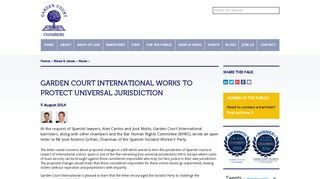 Garden Court Chambers (August 2014) "GARDEN COURT INTERNATIONAL WORKS TO PROTECT UNIVERSAL JURISDICTION" Highlights joint letter with BHRC to Chairman of the Spanish Socialist Workers’ Party raising concerns about proposed change to judiciary. 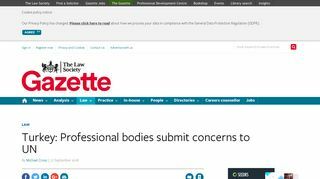 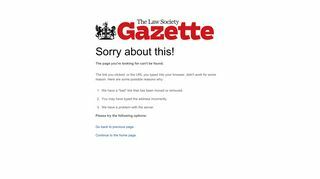 The Times (February 2014) "FGM victims ‘must sue’, lawyers suggest" by Lucy Bannerman. 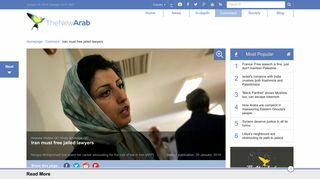 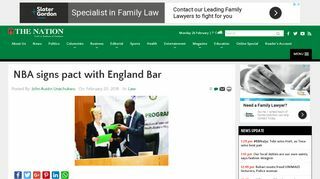 The Bar Human Rights Committee of England and Wales said the UK was in breach of its international legal obligations to protect girls and women from being mutilated. 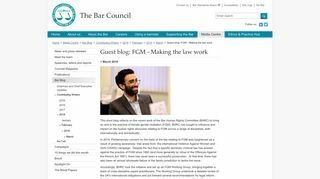 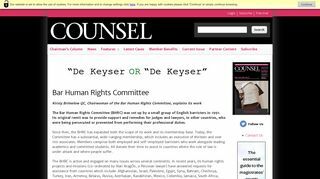 Counsel Magazine (July 2013) "Bar Human Rights Committee" by Kirsty Brimelow QC. 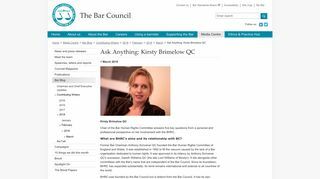 BHRC Chair Kirsty Brimelow QC explains the vital work of BHRC shortly after her election in 2013.